Everyone loves a good s’more. These nostalgic treats are the type that you randomly crave at the most inconvenient times. 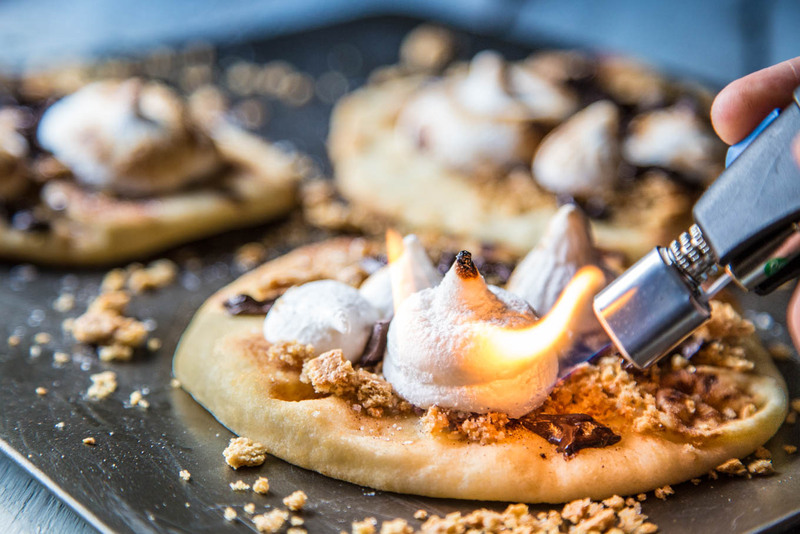 Crisp graham cracker, gooey chocolate topped with the lightest, cloud-like marshmallows. It’s the best of everything. 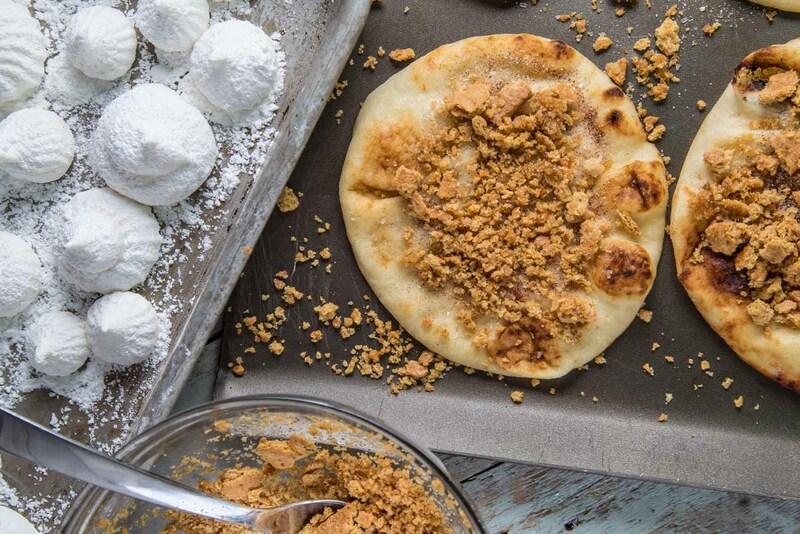 We’re bringing the campfire into the kitchen with this oven-baked naan based s’more recipe. Get it… Naan Campfire… No Campfire. Heeeeeey! I love a good fall campfire. Mostly because of the food that is almost always served around it. 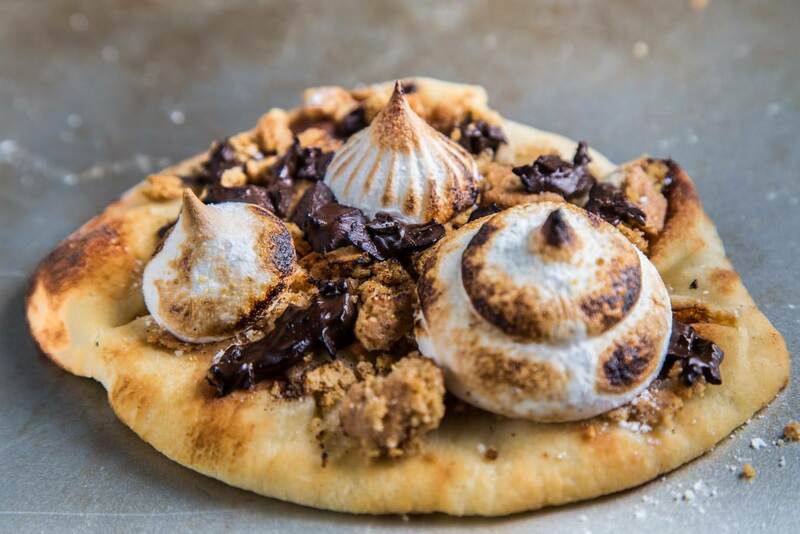 The s’more is the perfect blend of textures and flavors. You get the crunch from the graham, the chocolate both melted and more solid, the quest to get the perfect toast on your marshmallows. Personally, I’m one of those that tries to get a textbook Jersey Shore tan on my ‘mallow. Usually, that means I end up with it on fire. Luckily, both taste like campfire perfection. Y’all know what I’m talking about here. When I teamed up with Stonefire to develop a recipe, I wanted something that was unique. I’ve eaten my fair share of naan with chaat samosa, curries, etc. I’m one of those people that covets their bread with meals. — I started to brainstorm a bit… while eating marshmallows from the bag, as one does. There are some delicious flatbread/naan pizza recipes out there. Always good, but not really what I was looking for this time. A bag of mallows in, and it clicked. S’MORES! As a November baby, I am a sucker for the fall. Beautiful changing colors, perfectly cool nights, glowing campfires (!). It’s just the best of the best of the year. You don’t need to wait until things cool down to create your own melted masterpiece. Instead of the typical graham handles of the s’more, I decided to try and incorporate the naan that I picked up as the base. The buttery, rich bread is perfect for topping, savory or sweet. If I had a tandoor oven in my kitchen, I’d use it every day. The resulting texture from the high heat and clay base creates slightly charred bubbles on the outside of the bread, with a soft, fluffy interior. — Since I haven’t managed to build one yet, I rely on Stonefire to perfectly cook naan for me. The have several varieties available, including traditional, pizza crust, garlic, grain, and even the mini flats that I used for perfect portions here. Because they are made with absolutely no preservatives, and the freshest of ingredients, you can find the breads in the fresh deli/bakery section of your local grocery. I ran into Publix, grabbed one pack for these and a couple more for the freezer, and was on my way home in minutes. You can use the fresh naan for a week, or freeze it for months for a rainy day indoor campfire creation. 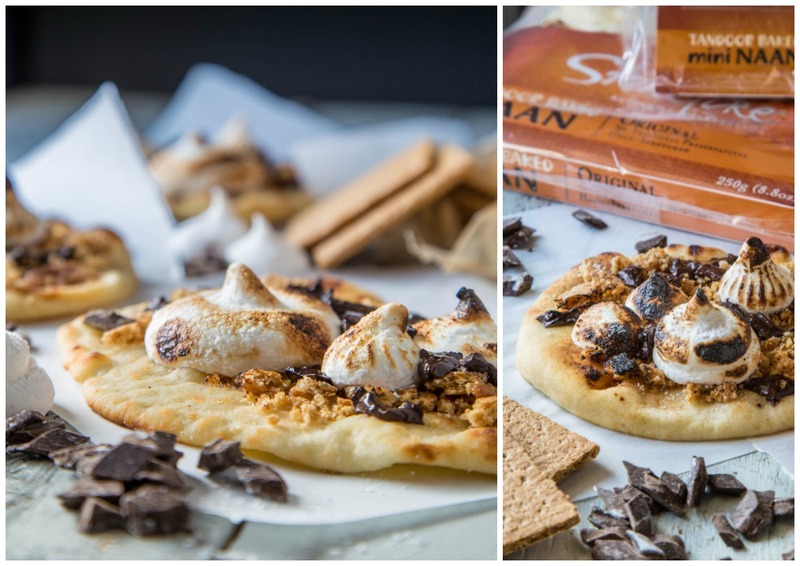 Be sure to share pictures if you make our S’mores or your own naan creations using #HelloNaan. This recipe couldn’t be more simple. 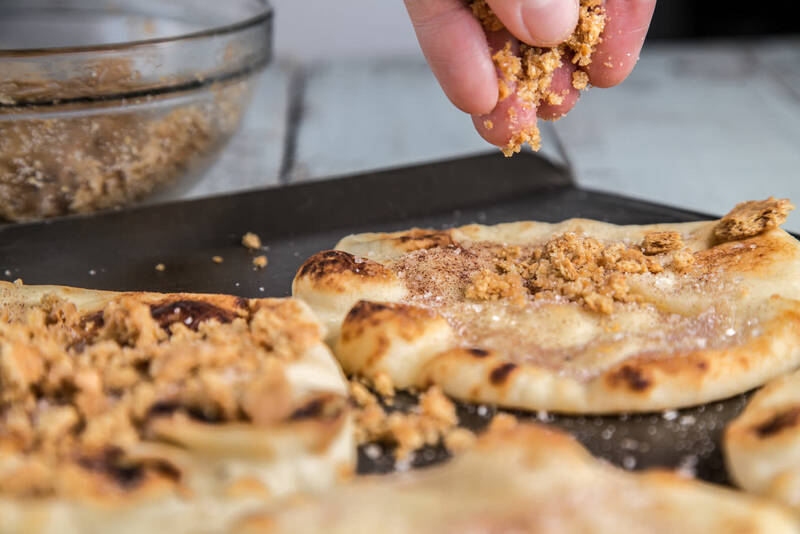 Take the naan minis, top them with some crushed graham, chocolate, marshmallows, and toast it a bit. Since the bread has those beautiful charred bubbles, they play perfectly to recreate the campfire texture from those fall days. The crunchy graham clusters perfectly balance the creamy chocolate. Baking the beaut gives you that priceless airy marshmallow center. You know the one. A bit of a crisp shell from the charring; sugary clouds inside. It just melts. 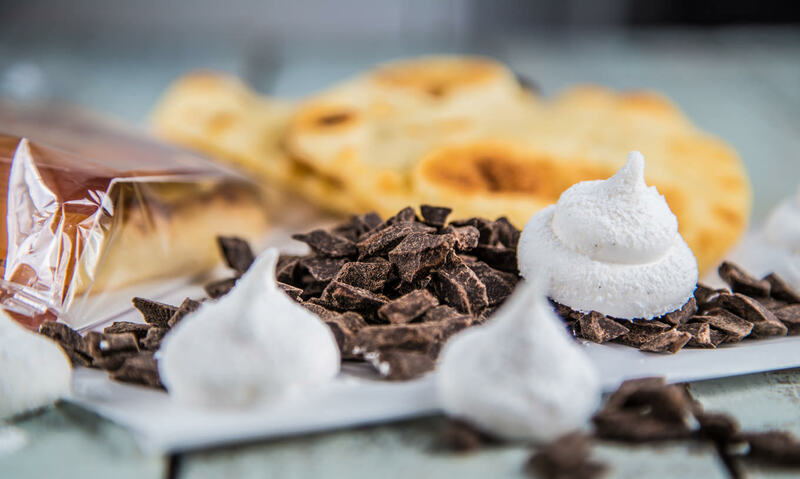 Bringing the backyard into the kitchen all year long, this sweet treat twist is the perfect unique dessert take to get through those long summer days or cold winter nights. Enjoy, y’all! 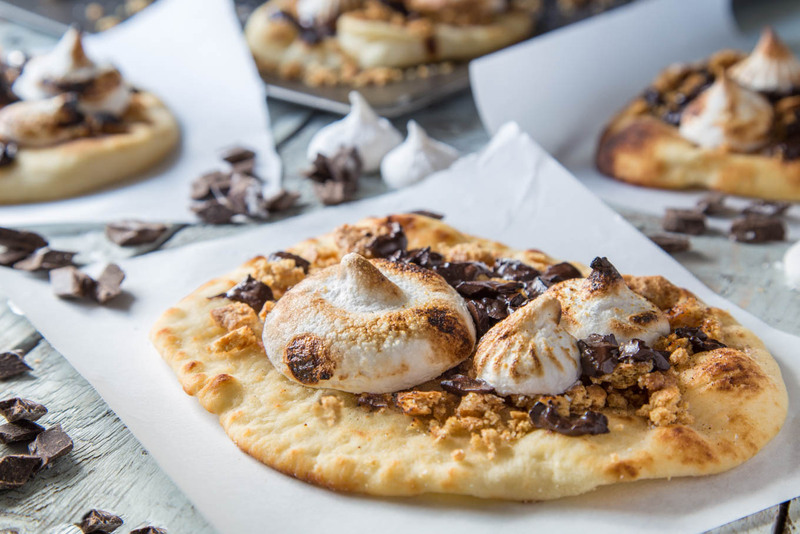 Twist on the classic campfire favorite -- Naan Campfire S'mores with mini naan flatbread, topped with graham brown sugar, chocolate, marshmallow. All melted in an oven to make all year long. From SouthernFATTY.com. 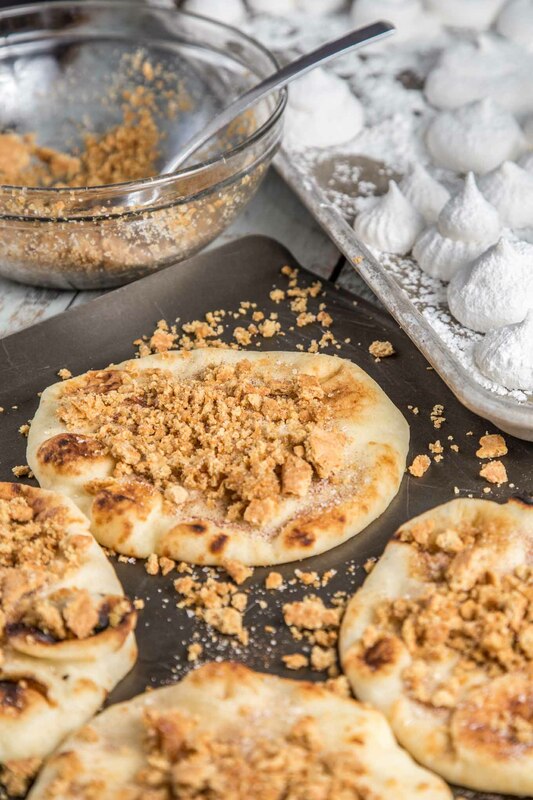 Place Stonefire Mini Naan pieces on baking sheet. Lightly brush tops with some of the melted butter. With the remaining butter, combine graham cracker, sugars, pinch of salt and stir. Divide between flatbreads, sprinkling around evenly. Place preferred chocolate pieces on top of each flat. Do the same with marshmallow. 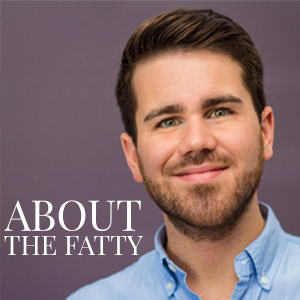 I made my own, but you can use store-bought. Bake breads until chocoate is melted and marshmallows softened. Remove and toast wither by carefully broiling in oven, or using a handy kitchen torch. Enjoy warm & find more recipes on SouthernFATTY.com. 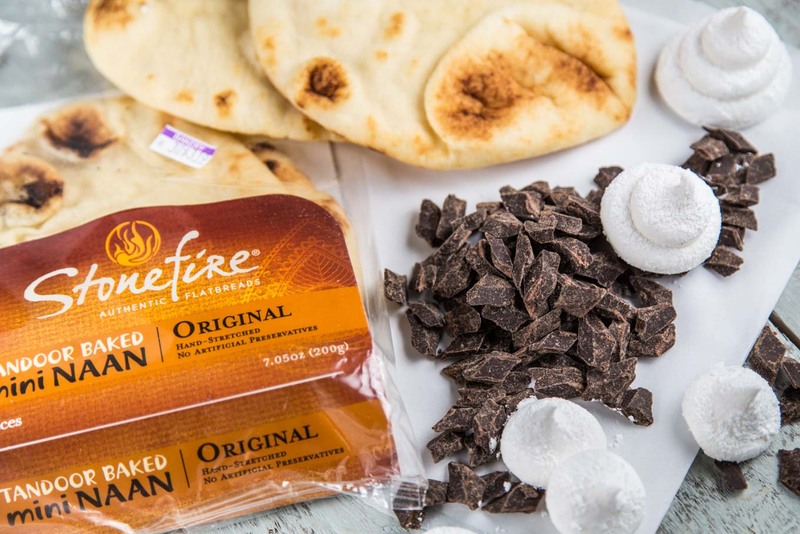 Are you a lightly toasted, or a fire-burned marshmallow fan? This is the most amazing dessert I’ve ever seen! I love stonefire products. Good choice to make dessert. LOVE their stuff! Was happy to work with them on this. And it loves you. Now eat ’em! Shut the front door. 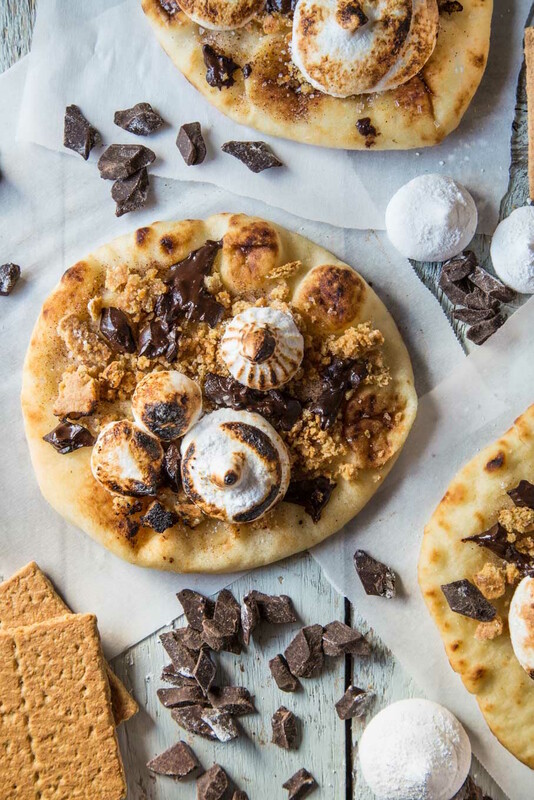 Naan and s’mores are basically my two favorite things. Who would have ever thought to combine them?? ?